Researchers at Aarhus University have developed a new type of electrochemical microsensor for CO2 as part of the SenseOCEAN project. Usually both optical and electrochemical CO2 sensors are based on a change in pH when CO2 diffuses through an ion-impermeable membrane and into a buffer contained within the sensor, but this sensor reduces CO2 to oxalate resulting in a current. It can be used to quantify CO2 partial pressures from 0.01% of CO2 saturation and upwards. It was chosen to use the aquatic plant Littorella uniflora as the first subject to be studied with the new sensor, as it obtains its CO2 and liberates its O2 through the root system through internal cavities (aerenchyma) where transport and mass balances are convenient to study. It is furthermore able to store CO2 obtained during the night as malate, from which it is again liberated during the day. 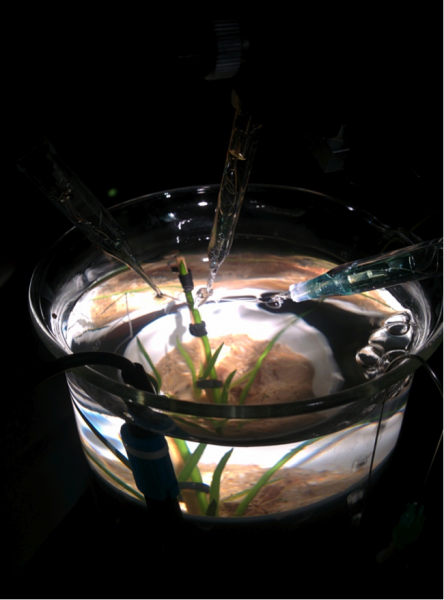 Measurement of O2, pH and CO2 inside Littorella leaf during light-dark cycles. The work is conducted in collaboration with Ole Pedersen, University of Copenhagen and Tim Colmer, University of Western Australia.